The Internet of Things (IoT) is rapidly changing the way we look at everything. The advantages we gain with smart devices are driving us to new levels of convenience in healthcare, manufacturing and automation, but IoT also presents many security challenges. So how do we efficiently manage thousands of devices? How do we effectively deal with mutual authentication? How do we know what is trustworthy and what is not? And most of all, how do we do this at a massive scale? This panel will explore the IoT challenges that we face and the solutions that we can implement today for a more secure future. Join this post-Black Hat panel as we look at the biggest trends and cyber threats covered during the Black Hat Conference 2018 in Las Vegas. - What are the biggest threats to security in 2018? - Charles Tendell, Renown Cybersecurity Expert, Certified Ethical Hacker & Host of "The Charles Tendell Show"
The session is being brought to you in partnership with ITSPmagazine. Tune in for an in-depth look into the key issues at the top of mind for CISOs across industries. This is a Part 2 of 2 CISO panels during Black Hat exploring the ever-changing role of the CISO, and how security professionals are coping with the threats and stress of protecting today's enterprise. The session is being brought to you in partnership with ITSPmagazine and will be streamed LIVE from Las Vegas during Black Hat. How can organizations increase the level of cyber awareness among their employees? What does a successful security awareness program look like? Discover what the experts think about inclusion, training and why investing in a strong security culture makes business sense. Cybersecurity isn't just about detecting and responding to threats; it's also about understanding an organization's risk. In an age of high-profile cyber attacks, it's becoming increasingly important to have a strategy and process for assessing risks and their potential impact on your business. Tune in for this exclusive panel on the key factors for a successful security strategy. This is a Part 1 of 2 CISO panels during Black Hat exploring the ever-changing role of the CISO, the factors influencing their success and the elements needed to build a more cyber resilient enterprise. Join security experts across the industry for an in-depth look into the ways Artificial Intelligence and Machine Learning are being used both to power cyber attacks, and to detect and respond to them faster. Join this panel of industry experts as they share their experiences and thoughts on one of biggest security conferences in the world, Black Hat in Las Vegas, along with their expectations from this year's event. This is a CPE credit session in partnership with ITSPmagazine and (ISC)². Tune in for an in-depth look into the evolving cyber threat landscape with CISOs and top security experts. The panel will examine the latest cyber attack trends and provide recommendations for defending enterprises and SMBs. The session is being brought to you in partnership with ITSPmagazine and will be streamed LIVE from San Francisco during RSAC week. Massive data breaches are becoming more frequent. Personal customer data is often exposed to hackers, leaving companies and individuals to deal with the aftermath. What is the real cost of a breach and how can we prevent, detect and respond to breaches? What are some of the things to do post-breach to prevent future cyber attacks? This is a CPE credit session in partnership with ITSPmagazine and (ISC)². 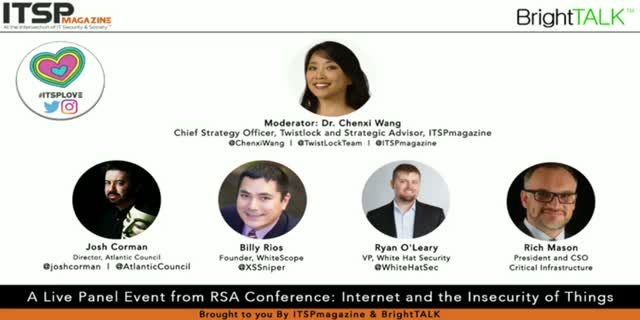 This panel will be streamed LIVE from San Francisco during RSAC week. The General Data Protection Regulation (GDPR) is a European Union law, but it's going to impact businesses beyond the EU. Basically, any business that collects and processes personal data of EU individuals will need to achieve GDPR compliance by deadline day, May 25th, 2018. - Why we should think beyond GDPR when it comes to improving data security? - Are you compliant / ready when GDPR goes into effect next month? - What are some last-minute items to complete before the GDPR deadline? Join top experts for this interactive Q&A roundtable, streamed LIVE during RSAC week, as they discuss the implication of GDPR on managing digital identity, customer data, privacy and cyber security. This is a CPE credit session in partnership with ITSPmagazine and (ISC)². Artificial intelligence and machine learning can power cyber attacks and disrupt the operations of organizations on a global level. ML can also help organizations detect and analyze threats faster, as well as respond to attacks and security incidents. What are the latest advancements in AL & ML? How can we incorporate ML to improve our security posture and better protect our data? This is a CPE credit session in partnership with ITSPmagazine and (ISC)². Tune in for an in-depth look into how enterprises are ensuring a safe migration to the cloud, protecting our data and processes in the cloud, as well as staying up to date on the latest cyber threats. The session is brought to you in partnership with ITSPmagazine and will be streamed LIVE from San Francisco during RSAC week. Thanks for your interest in our webcast where we will be discussing how to secure applications that rely on third-party and open source software. Aside from the data they collect, create, and store, applications can oftentimes be an organization's greatest digital asset. Building custom applications to match the customer and market demands mapped to revenue objectives and available resources can be tremendously rewarding, but also a potentially-huge undertaking. Ultimately, time to market is always a factor ... a requirement that almost always wins out over security. One way to tackle the time and effort to deliver more quickly is to leverage third party and open source components. But, do these elements save you in the long run - or do they introduce more risk in the form of potential vulnerabilities that are either not easily uncovered (at best) or not easily patched (if patchable at all)? Remember, when you register for this expert webcast you will also receive a download link for a new white paper titled "Application Security in an Open Source World." Andy Wickersham, AppSec Leader, Fortune 100 Co. The recent Equifax data breach, which may have jeopardized the personal information of 143 million U.S. consumers, will likely haunt us for years to come. Is your company based in the US and also operating in the EU? There are things you MUST learn about the Global Data Protection Regulation (GDPR). This law, which goes into effect May 25, 2018, will have an impact on your business. This expert webinar will help you prepare for what's ahead. - Why small and medium are required to meet GDPR just like big companies. - What can small- and medium-sized companies do to reduce their exposure? - Why is this a good thing for companies to adhere to in the long run? - What can mid-market companies do to streamline the process? - What is the role of outsourced services in this? What are they? - What areas of waste might exist that can be eliminated? - GDPR program ownership - Is a DPO necessary? - What a risk-based regulation means to the business. - How to manage risk and reduce exposure. - Policy definition and control implementation requirements. - When something goes wrong, who do you bow down to? The EU or the US? The requirements that GDPR places on organizations are wide-ranging and will impact everything from the people in the organization, to the processes and policies guiding the organization, straight through to the technology running the business. But before you can even begin to address the GDPR you need to be able to control your data. The first step in this process is knowing precisely what data you have and putting processes and tools in place to help you expose the data you don’t know you have. - What is the Global Data Protection Regulation? - Who does it impact and why? - What do organizations need to be aware of as they approach their compliance program? - What are some of the common misconceptions organizations have? - What things are often forgotten when organizations put together their compliance program? Today, security on the Internet is dependent on the trust between participants on the network. This is challenging because trust involves more than humans in this case and there are over 8.7 Billion devices already online today. And, trust is about to become more involved because, according to a Cisco study, 99% of the things in the world today will be connected to the Internet in the near future which means we will need a new model for trust and digital identity to manage this massive scale of trust we will need. - What are some of the devices we see being used in business? - Why do devices need identities? - What does device-to-user authentication look like? - What does device-to-device authentication look like? - What role do applications play in the IoT world? - How can all of these identities and activities be managed and policies enforced at scale? Disruptors and visionaries across the globe are pushing the boundaries of science and technology, economics and industry, healthcare, policy, communications, and governance. From these advances emerge new career paths, educational disciplines, and opportunities for creation and discovery. But things don't always work the way we expect them to, and the consequences of disruption are impossible to predict. What is sacrificed for the sake of efficiency or convenience? Who gets to make that call? Whose fault is it when pre-teens get radicalized online, or health records get misused for unauthorized research? And whose job is it to prevent that from happening? Is prevention even possible? Individuals, enterprises, and society writ large have the right and responsibility to proactively shape and secure the future, but our ability to do so is at risk. As technology continues to proliferate without being well understood, people who fall victim to its failure or misuse feel more and more disempowered to prevent future damage. This is The Tech Effect: the complacency driven by the complexity of the technology ecosystem, and a rejection of responsibility for individual and collective safety, security, and ethics. It’s time to take charge of our digital future. Join us for this lively conversation. ITSPmagazine is an online publication that focuses on Information Technology Security and the influence that it has on our everyday life, as Individuals and as the Society we live in. And, for a change, the other way around.